I’ve written many times about the long learning curve we face when we decide to become a writer. The journey is always longer than we think because we don’t know what all we don’t know. I’ve also talked about how it’s hard to label any particular writing skill as beginner or advanced, because we all have different backgrounds, strengths and weaknesses, and learn skills in different orders. Just because we learn a skill later on in our learning curve doesn’t make it advanced. 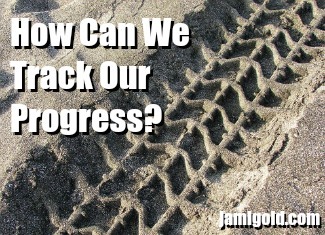 So how can we track our progress? How can we tell whether we’re improving? How can we feel good about our writing? Before we get into our options for tracking our progress, I want to mention a caveat. While we understandably might want to know where we are in our learning curve, we must also remember that being a writer is a journey and not a destination. For every skill we master, we’ll probably become aware of another one (or three) where we’re still at the beginner level. And even after we master the majority of writing skills, we constantly have to fight the effects of entropy and sloppiness. to point out to ourselves how far we’ve come. I’m going to repeat and emphasize that final point because it’s that important. There’s no such thing as being “done” with our “become a writer” to-do list, so the purpose of tracking our progress is not to see how close we are to that imaginary destination. Instead, it’s precisely because there’s no concept of “done” or “complete” that we can often despair along our writing journey. The journey can often feel like we’re going in circles on a Möbius strip. A positive response to a query can make us feel like “Yay! Progress!”—which then can be followed up with a pass, making us feel like we’re back at square one. For every positive aspect, there’s no guarantee that all our troubles are over. One beta reader can love our work, and another can rip us to shreds. A great contest score or review doesn’t mean they’ll all be like that in the future. But those positive events are milestones. Even if they don’t result in forward movement toward publishing success, they’re still accomplishments. They still tell us that we’ve made progress from our starting point. Although we can’t tell how far we have yet to travel to have some measure of success, we can tell how far we’ve come from the start of our journey. That measurement of what we’ve accomplished and learning is what I mean by “tracking our progress.” Sometimes recognizing that we have come far can make all the difference in holding off our frustration and self-doubt. We have many options for tracking our progress along our writing journey—as many as we can think of for our circumstances. This list is but a sampling of what we could come up with. Have we finished a story when we used to get stuck partway? Have we received positive feedback when we used to just get criticism? Have we noticed our contest scores improving? Have we received a request or an offer from an agent or editor, based on our writing? Have we impressed someone whose opinion we value? Is the feedback we receive now more encouraging, with faith we can pull it off? Have we received positive reviews from readers who don’t know us? Have we overcome a deficit in a writing skill to become proficient? Should We Use a List? Specific to that last option, we could attempt to create a list of all writing skills possible (adding new ones as we come across them) and crossing each entry off as we receive positive feedback about that aspect of our writing. That list would never be an end-all-be-all to-do list for becoming a skilled writer (especially as we should constantly be adding to it as we become aware of new skills we’ve yet to master). As I said above, tracking our progress isn’t about seeing how close we are to an imaginary destination. However, for some of us, the act of checking things off a list can give us a sense of accomplishment. If that’s the case for us, a list recognizing things we’ve learned could help us. Another way of seeing how far we’ve come is to look at our old writing—perhaps a story we never completed or one we set aside months or years ago. Often, when we look at our old writing, we’ll see mistakes that we’d never make now. Maybe we notice it’s full of telling rather than showing. Or maybe the writing is lacking subtext, or our voice is weak, or our characters are shallow, etc. Each of those issues proves that we have made progress. We’ve learned better what to avoid or how to make good into great. Each mistake that we can now recognize (and know how to fix) is a skill we can add to our list of accomplishments. You’ll notice above that I mentioned a two-pronged aspect to mastery: the ability to find (or identify/recognize) a problem and the ability to fix a problem. There’s often a difference between those skills. Just because someone can accurately point out an issue in our writing doesn’t mean that their suggested solution is the right way to go. On the other hand, just because someone can tell us how to improve our writing in a certain way doesn’t mean they can point out specifics of where best to apply those fixes. The same variations can apply to us when it comes to drafting or self-editing. With some writing skills, we might recognize that there is an issue before we learn how to fix it well. And as I discovered this past weekend, with some skills, we might learn how to fix problems before we learn to identify them. I’ve discussed before how I figured my improving contest scores were a good sign for progress, but those numbers couldn’t tell me how I’d improved. This past weekend, out of random curiosity, I decided to open a file of a trunked novel from years ago. This was my first original novel, which I’ve called my “learning curve story.” As I learned each new skill, I did yet another editing pass to apply my new knowledge. Because of the countless (no joke—perhaps nearing triple-digits) editing passes, I had this idea in my head that the story wasn’t in bad shape. That impression was reinforced when I last opened the file about a year ago and still didn’t think it was that bad. Even though I’d had years of writing experience since that first story—and had published my debut novel—I couldn’t recognize my progress in writing quality by looking at that file. Fast-forward to this past weekend. I opened the file again, once again expecting to see decent-ish writing. I only made it a few chapters before I closed the file. The writing is now cringe-worthy to me—and more importantly, I can identify why. I can now point out the out-of-character phrases, the missing visceral responses, the pacing issues, the lack of emotions, the naming of emotions, etc. In other words, I can now recognize how my writing has improved. What Changed? How Could I Suddenly See the Problems? Was it simply the distance of time that allowed me to see the problems? Or was it because of something else? If we know enough to fix a problem but not enough to identify it (or vice versa), we’ve only partially mastered the skill. A similar issue is when we understand something well enough to do but don’t understand it well enough to explain. For example, we can often fumble our way through a concept when dealing just with ourselves, but trying to bring someone else up to speed requires a deeper, fuller understanding. Those problems I found in the story were some of my most recent skills, so I’d learned to draft new material to avoid those issues, but I’d never learned how to find them in old material. In essence, I needed to be able to teach myself how to find the problem before I could even think about self-editing that old story. So the change of suddenly being able to see the problems that were always there—and yet that I couldn’t see even as recently as a year ago—tells me that I’ve reached a new level of mastery. Thanks to my blog writing and editing experience over the past year, I’ve learned how to teach those skills to others (including myself). Do you like tracking your progress? What’s your purpose in tracking your writing improvements? What methods have you used for tracking? Have you ever run into the issue of being able to fix problems before you could find them (or vice versa)? How did it affect you? I’ve been re-reading some old NaNo stories that I wrote about ten years ago. Honestly? I thought I wrote better then than the RD novel I’m writing *now*. Even the NaNo RD I wrote that I originally thought was total crap. Of course, that’s *me* rereading my own old stuff. I can see mistakes (grammatical, typos, POV shifts here and there) but the things did pretty much what I intended them to do at the time. My main failures with them was stopping and not getting to the end! So there’s that. I’d say that’s a pretty big thing I need to improve, LOL. In other words, there are plenty of things we can like about our old stuff–and maybe it’s not a bad thing to not be so hard on ourselves 😉 –but the point is to see what we can learn about our progress. Or maybe we can learn about our bad habits…we might recognize mistakes in old material, where we’re distant from the writing, far better than in our current stuff, letting us know what our bad habits still are. LOL! That distance can also explain why we might enjoy older writing more than our current stuff. When we have enough distance, we can read it like a reader and not have all the hair-pulling effort it’s taking to improve in the back of our mind. 😀 Thanks for sharing! Looking at old writing is the best way to gauge for me. I always considered myself a good writer–mostly because that’s what teachers had been telling me my whole life–but looking back on the stuff that I wrote when I was just starting to take this whole becoming-a-novelist thing seriously really makes me cringe. So many amateur mistakes! 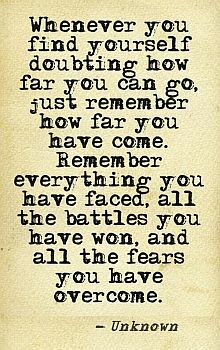 But it also makes me feel good because I’ve come so far, and hopefully I have even further to go. Exactly! There’s a difference between maybe writing well from a grammar perspective and writing well from a deep-POV perspective, for example. Like you, the mistakes I saw were all amateur mistakes, and I feel good that I might actually be able to revise that story in the future–now that I can see what’s wrong with it. LOL! Here’s to making (and recognizing) progress for both of us. 😀 Thanks for the comment! I feel a need to know about any progress I’ve made. Without this, my confidence lacks. When that happens, my ability to write dwindles. My competency in the craft disintegrates. I understand. Just as I want to feel forward momentum in stories, I want to feel it in my life too. 🙂 Thanks for the comment, and I hope these tips help! And LOL! to your findings with pantsing with the story beats in mind. Perfect! I’m so glad my method is working for you. 😀 Thanks for the comment! Unfortunately, I had beta readers for that trunked novel, and now I feel like I have to apologize to them all. LOL! So it could be worse. 😉 Thanks for stopping by! Your blog is one of very few writing resources that “click” for me (seriously, thank you so much). And reading it every week has vastly improved my writing skills over the past year alone. Some posts speak to me so much I have to print them out, while others I can read and instantly absorb. Either way, the process of taking in fresh information on the regular is constantly upping my well of internal writing resources that I can draw on when I’m writing. How to measure this? I have no idea. I guess it’s that cringe you get when you’re reading an earlier part of the draft prior to learning that particular skill. In every other area of my life, I am a list person. But when it comes to writing, it feels inorganic to me to keep a list. Just because writing is something that will always be a process. Writing skills are something that will always be changing and evolving. It feels more natural to me just to trust that when I’m ready (as in I have the necessary foundation) to improve a certain skill, I’ll become aware of it, and dive right in and learn about it. When I was in the steep learning curve, I found that I could reread a beta reader or contest judge’s feedback every few months and find new things to pull out and apply. Sometimes we don’t know enough yet to see how something’s applicable to our story, and then after we learn the underlying fundamentals, we can pick up on the advanced suggestions too. 🙂 It’s definitely tricky, but it sounds like you’ll get there! Good luck and thanks for the comment! I have trouble telling these sorts of things–while anything from around 2011-2013 I instantly go “Nope” with (cringey writing style, much? ), more recent stuff tends to be a bit harder to tell whether I’ve gotten better or not. Then again, people really like my writing style and how I write my characters (which makes me go all blush-y), so I guess that’s a plus… It’s definitely something to think about!